Shepherd Offshore is one of Europe’s leading service providers, developing and operating facilities while supporting world class manufacturing within the North East of England based on the North Bank of the River Tyne. The Company has strategically developed local infrastructure with capabilities and services attracting the Oil and Gas sector, Marine, Renewable Energy providers and Construction Industries to the River Tyne. All supported and communicated through our many corporate values based on responsible regeneration and partnership working. Shepherd Offshore has developed and funded these bespoke facilities and manufacturing clusters with the company value, focusing on providing first class service’s to compliment these manufacturing companies so they can compete globally. We provide a fully integrated offshore supply base at both Offshore Technology Park and Neptune Energy Park ensuring safe and effective on-time delivery of product to projects. Our business manages bespoke engineering projects, abnormal / normal marine load outs supported by crane heavy lift capacities, fabrication services, wide range of transport & material management solutions, with in house logistics and plant capabilities utilising our extensive infrastructure. As a company Shepherd Offshore manage more than 100 + vessel mobilisations and demobilisations every year through a strong marine management team that delivers time and again. Our port side facilities are serviced by heavy abnormal load routes providing direct access to major trunk roads and linking both facilities allowing transfer of product of up to 400t. We provide a full range of logistics, operational and project management and support for the offshore wind and marine industries while continuing to invest and grow in portside facilities for manufacturing assembly, construction and Operations and maintenance purposes. 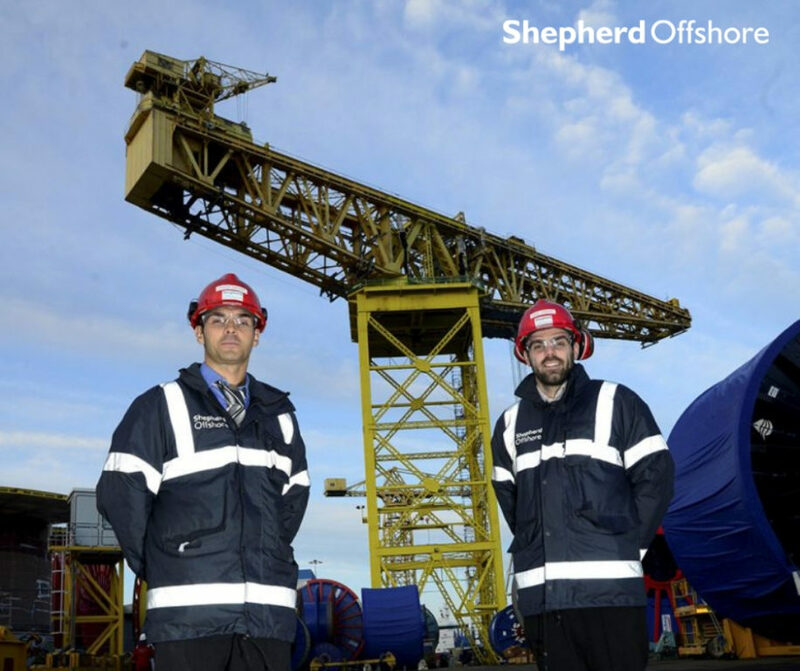 Shepherd Offshore have over 150 acres of development land, deep water access for large scale installation, supply vessels supported by heavy load out capability and lay down areas. The facility capacity is supported by lift / crane capacity up to 700t on site. Shepherd Offshore have attracted blue chip companies to invest in the region such as Technip FMC, GE Oil and Gas, IHC, Bridon Bekart, BAM & EDF and supported through our facilities Subsea 7, Siapem, McDermott’s, Total, BG, BP, Shell, Anadarko Petroleum, Exxon, Dong, Chevron and Statoil. Construction projects have utilised one of the largest dry-dock facilities in the UK and has been supported by heavy lift capabilities on site. The backbone to the Shepherd Offshore Mission Statement is to offer 1st class services, cost effectiveness, efficiency safety and flexibility and in turn promoting a world class reputation. To view our editorial click here, you will see us on page 4.